nVidia Shield TV... easy to use, set-top box feel (as it's one vs. a HTPC), and now with Amazon 4K on it, even more compelling. Just wish it did 3D MVC, then I could get rid of every other media player in my home. (2017-01-16, 19:16)Tinwarble Wrote: Yes, the 2015 16GB Shield has 2 USB type A, and one USB type C. This is still standard on the Pro models. 1) What many wanted to know: No, the new Shield doesn't support YouTube HDR in this update. 2) HDR output is no longer limited to 4K >50Hz refresh rates. It does work at 23.976/24.000Hz, but the output will be YCbCr 4:2:2. This may not be good for all TVs esp. Samsung SUHDs. In fact, all 24p content is output with YCbCr 4:2:2 if you enable refresh rate switching. 3)It doesn't look like nVIDIA has implemented IEC61937 passthrough. They seem to have stuck with the RAW passthrough. 4) SPMC may need some tweaking. I noticed video freezing for a few sec. at the start of the playback. (2017-01-16, 23:35)wesk05 Wrote: 2) HDR output is no longer limited to 4K >50Hz refresh rates. It does work at 23.976/24.000Hz, but the output will be YCbCr 4:2:2. This may not be good for all TVs esp. Samsung SUHDs. In fact, all 24p content is output with YCbCr 4:2:2 if you enable refresh rate switching. So are you saying that it's the opposite of the previous where it defaulted back to RGB? (2017-01-17, 00:01)Tinwarble Wrote: So are you saying that it's the opposite of the previous where it defaulted back to RGB? No, it switches to YCbCr 4:2:2 for lower refresh rates. This is at 4K. I haven't tested what it does at 1080p (all HDMI 1.4). 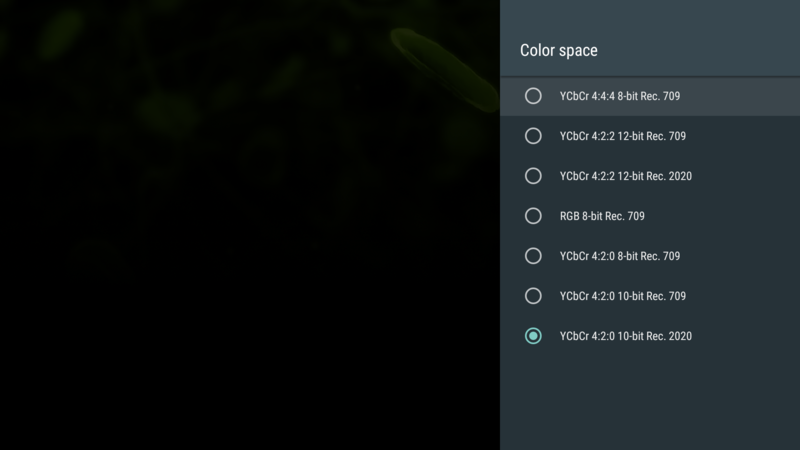 Color space options have been revamped and there are more options now. See screenshot below. It looks like folks with newer HDMI 2.0 AVRs connected to HDMI 1.4 TVs will be in for a surprise. 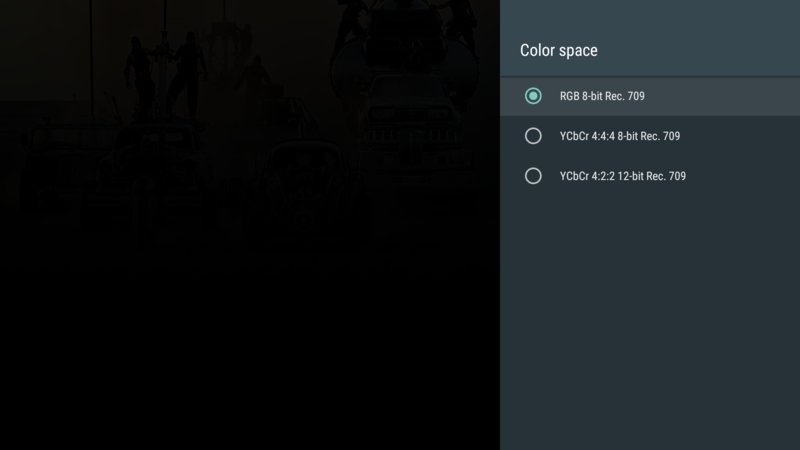 Not only has the refresh rate switching bug not fixed, you can't even change the refresh rate or color space in such configuration. It seems to falls back to RGB 1080p59.94Hz. Ok! When you said " all 24p content is output with YCbCr 4:2:2", I wasn't sure if you meant just 4K or actually "all" content no matter the resolution. So still issues with mixed HDMI. (2017-01-17, 01:27)Tinwarble Wrote: Ok! When you said " all 24p content is output with YCbCr 4:2:2", I wasn't sure if you meant just 4K or actually "all" content no matter the resolution. Actually that is exactly what I meant. When you set the output resolution to 4K, ALL 24p content is output as YCbCr 4:2:2. I will need to check what happens in 1080p setups. @wesk05, I get no audio with any HD audio formats w/RAW or IEC options in SPMC. Guessing this is because of your point #3 above? Any way to get HD audio passthrough via SPMC? BTW, got a second unit today from Best Buy, and same responsiveness issue w/remote in a different room. It's Bluetooth, not IR (as I was guessing), but button presses take a while to register about half the time. (2017-01-17, 01:56)hdmkv Wrote: @wesk05, I get no audio with any HD audio formats w/RAW or IEC options in SPMC. Guessing this is because of point #3 above? Any way to get HD audio passthrough via SPMC? I am not seeing any issue with HD audio passthrough in SPMC. The RAW passthrough is working for me. IEC passthrough doesn't seem to work at all. My remote seems to be working fine so far. My unit came from Amazon. I may be a little close to the unit (less than 2 feet). I will check once I move it to the media room. That's what I meant too. Didn't mean for it to sound like I was referring to content resolution. There seems to be a lot of people reporting issues with the remote. Some have said that the remote is dead out of the box, even over at Android Police: http://www.androidpolice.com/2017/01/16/...-a-reason/ they had issues. Might be worth checking to see if the problem is with the batteries. @wesk05, re: the remote, try further away (over 10-15ft) and w/o line of sight. Responsiveness is spotty. Will the Shield's Google Assistant support work with Kodi? And other apps? Can I use the always on mic to start the box up, power on my tv, and play a movie with voice commands? Just like how Google Home does? This is the main selling point of the new Shield for me. Nobody knows. Google Assistant hasn't been released yet for the Shield. But it should work much like the Google Home. (2017-01-17, 02:34)hdmkv Wrote: @wesk05, re: the remote, try further away (over 10-15ft) and w/o line of sight. Responsiveness is spotty. I did check the remote further away (~12 ft) w/o line of sight and I am still not going to complain about the responsiveness Yes, it quits working completely at around 15ft. I am not sure whether they have made any design change to the USB 3.0 ports. If they haven't, the interference from that can significantly reduce Bluetooth range which also operates in the 2.4GHz ISM band. I did notice that even the 5GHz Wi-Fi signal strength is lower on the new Shield compared to the old one. I got my new Shield TV today and SPMC is super great. Everything I have to play over NFS from my NAS seems to work, mpeg4 SD and HD, h.264, h.265, passthrough audio from aac to mp3 to ac3 dts and atmos. Refresh rate switching works as well and I see no tearing on 24 fps film material. Haven't tried any interlaced content though. The SPMC interface is snappy and fluid as it was on my i3 linux box. The shield itself, streaming games from my PC worked well in game, but launching games were a 50/50 chance of success either through Steam or regular GeForce Experience. I rented a video (The Accountant) through Google Play Movies and it played fine but was only in PCM stereo, but that is more of a gripe with google, as other videos I had purchased have 5.1 sound. I am disappointed that the always on Google Assistant isn't in yet. I see the website touts the feature but then says Coming Soon. boo! My remote seems to work from another room, no like of sight needed. I am a little confused about one thing though: how does one charge the remote? It doesn't seem to have any place to plug it in or put a battery in it.